15 February 1961, 09:05 UTC: This Boeing 707-329 airliner, registration OO-SJB, under the command of Captain Ludovic Marie Antoine Lambrechts and Captain Jean Roy, was enroute from Idlewild Airport, New York (IDL) to Brussels-Zaventem Airport (BRU) as SABENA Flight SN548, when three miles (4.8 kilometers) short of the runway at an altitude of 900 feet (274 meters), it pulled up, retracted its landing gear and accelerated. The airliner made three 360° circles, with the angle of bank steadily increasing to 90°. The 707’s wings then leveled, followed by an abrupt pitch up. OO-SJB spiraled into a nose-down dive and crashed into an open field 1.9 miles (3 kilometers) northeast of Brussels and all 61 passengers and 11 crew members and 1 person on the ground were killed, including the entire U.S. Figure Skating Association team, their families, coaches, judges and officials. 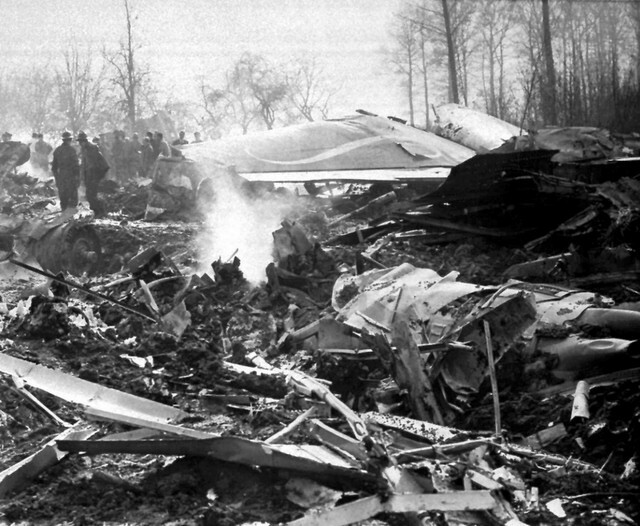 Wreckage of SABENA Flight SN548, Brussels, Belgium, 15 February 1961. The Federal Aviation Administration commented that the most plausible hypothesis was a malfunction of the stabilizer adjusting mechanism permitting the stabilizer to run to the 10.5° nose-up position. Societé Anonyme Belge d’Exploitation de la Navigation Aérienne (SABENA) was the national airline of Belgium. It was based at Brussels and operated from 1923 to 2001. 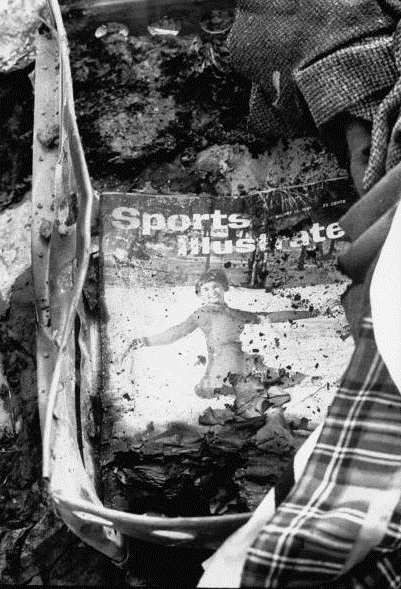 This February 13, 1961 edition of Sports Illustrated was found in the burned-out wreckage of SABENA SN548. 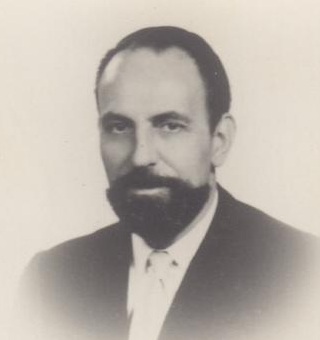 U.S.F.S.A. 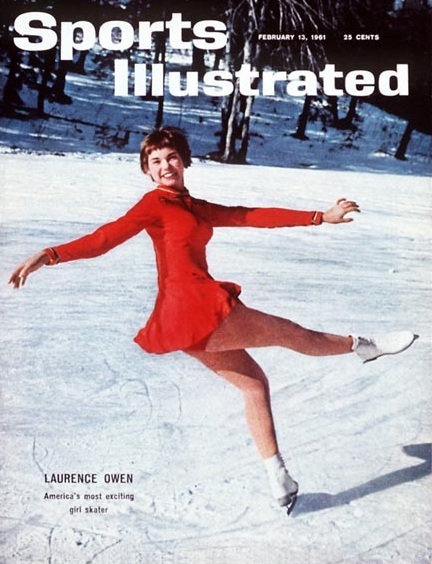 figure skater Laurence Rochon Owen’s photograph is on the cover. The 16-year-old skater is second from the left in the team photograph, above. 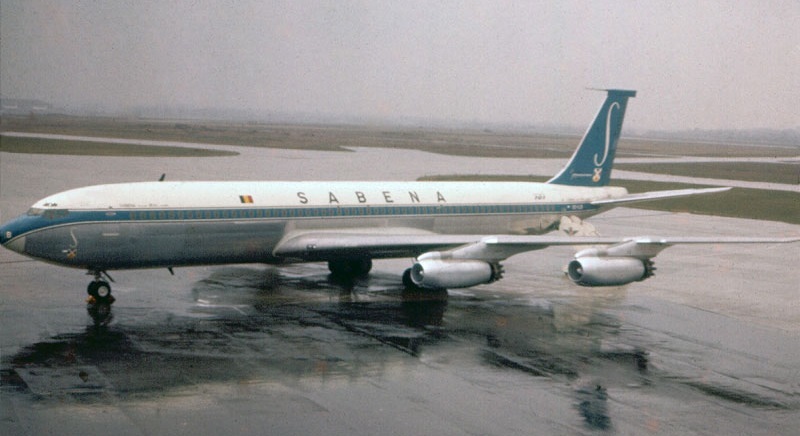 SABENA Flight SN548 was a Boeing 707-329 Intercontinental. OO-SJB, Boeing serial number 17624, was nearly a new aircraft. It made its first test flight 31 December 1959 at Renton, Washington, and was delivered to SABENA 15 January 1960. 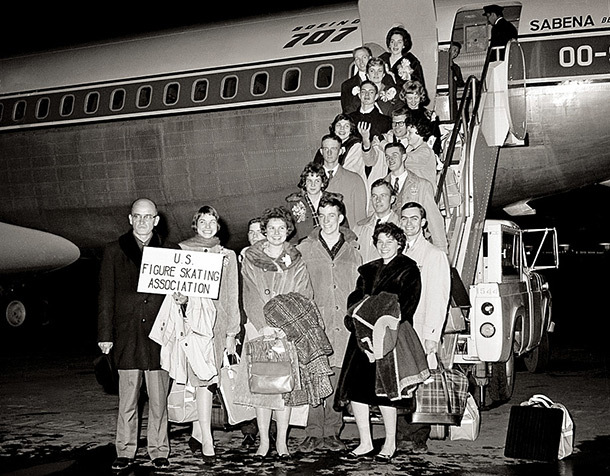 At the time of the accident, it had just 3,038 total flight hours (TTAF). The Boeing 707 was a jet airliner which had been developed from the Model 367–80 prototype, the “Dash Eighty.” It was a four-engine jet transport with swept wings and tail surfaces. The leading edge of the wings were swept at a 35° angle. The airliner had a flight crew of four: pilot, co-pilot, navigator and flight engineer. The 707-329 Intercontinental is 152 feet, 11 inches (46.611 meters) long with a wing span of 145 feet, 9 inches (44.425 meters). The top of the vertical fin stands 42 feet, 5 inches (12.928 meters) high. The wing is considerably different than on the original 707-120 series, with increased length, different flaps and spoilers, and the engines are mounted further outboard. The vertical fin is taller, the horizontal tail plane has increased span, and there is a ventral fin for improved longitudinal stability.The 707 pre-dated the ”wide-body” airliners, having a fuselage width of 12 feet, 4 inches (3.759 meters). The airliner’s empty weight is 146,400 pounds (66,406 kilograms). Maximum take off weight (MTOW) is 333,600 pounds (151,320 kilograms). At MTOW, the 707-329 required 10,840 feet (3,280 meters) of runway to take off. OO-SJB was powered by four Pratt & Whitney JT4A turbojet engines, producing 15,800 pounds of thrust, each. Its maximum speed is 0.80 Mach (552 miles per hour, or 889 kilometers per hour). It had a range of 4,298 miles (6,920 kilometers). The Boeing 707 was in production from 1958 to 1979. 1,010 were built.